Black Holes might not seem to be visually engaging at the outset. Ultimately there’s not a lot to work with when you think of a hole that swallows light where nothing can be seen. But for me and the work we do at Cognitive this is exactly the sort of challenge we love. We first had the privilege of being able to visually translate Professor Hawking’s work on Black Holes when we illustrated his 2016 Reith Lectures for BBC Radio 4. As we had a track record in bringing esoteric concepts to the screen, so they could be understood by as wide an audience as possible, we were asked to create an animation to accompany Professor Hawking’s words to be housed on the BBC website. The feedback from Professor Hawking and his team was very positive, and they wanted their own animation that they could use more widely to raise awareness of their ongoing work. So we started visualising the work that Professor Hawking, Malcolm Perry and Andy Strominger were doing on ‘Supertranslations’, or ‘Soft Hair’ in Black holes. The world is a complex place and the information we receive comes at us in a variety of ways. Many of us have a preference on how we digest information. When I read, my brain automatically converts this information visually. I have a visual or spatial preference. It turns out that a lot of people are visual learners. According to the Social Science Research Network people absorb, process, and recall what they are taught in very different ways. Verbal learners, a group that constitutes about 30% of the general population, learn by hearing. Experiential or Kinaesthetic learners - about 5% of the population - learn by doing; for example clinical work, role-playing exercises. Visual learners - the remaining 65% of the population - need to see what they are learning, this is where Scribing becomes a key tool – because it marries the written word with pictures in space! When I was first researching ‘Supertranslations in Black Holes’ I was quite daunted. Thankfully the difference between the abstract papers I looked at and the script I received were lightyears apart. Professor Hawking has always been adept at humanising theoretical physics in his writing style. Neuroscientist David Eagleman and Composer Anthony Brandt explored concepts that define the creative mind in their book, ‘The Runaway Species’. They explain how our relentless drive to create makes us unique. We love novelty and inventiveness, and so this is what I aim to do in my visual translation work. Creativity results from pressing history into new forms. Ultimately, everything has been done before but novelty arises when you take what has been done and start to jam with it. Eagleman and Brandt call this ‘Bending’, ‘Breaking’ and ‘Blending’ and you can see evidence of these processes throughout my visual thinking. For example, we can look at how we take a familiar concept and blend it with another to make new meaning. I used this approach a number of times in the Supertranslations piece, when I used Alice in Wonderland and blended the iconography from the fantastical children’s tale with concepts from Quantum Physics. Funnily enough there are more similarities than you would think on first inspection. Alice starts her journey by falling down a rabbit hole – here we can throw her into to a black hole along with the concept of time, with the white rabbit’s pocket-watch. Upon entering the hole, she is transformed, her particles become something else but essentially, she is still Alice. The Cheshire Cat is a good illustration of what Schrodinger was alluding to here. He is ‘there’ but not ‘there’ – he exists in two states, invisible and visible only by his wide smile. Some information is left over. The caterpillar asks of Alice, ‘Where are you?’, which is what Hawking is asking of the information that has fallen into a black hole. Where are you and how can we understand where you have gone? This is where symmetries come in. 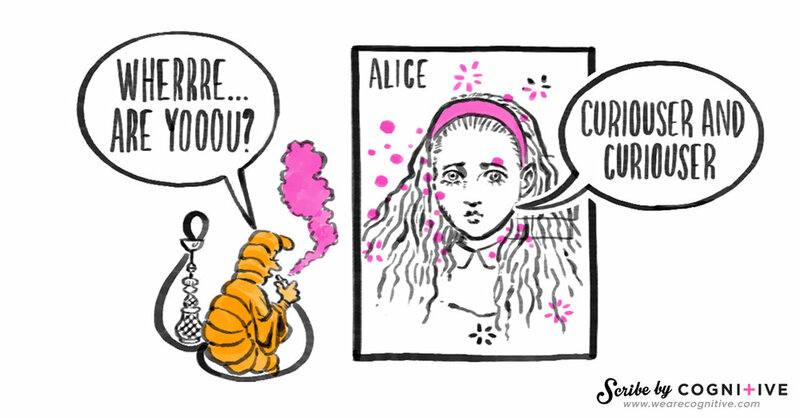 Continuing with the Alice theme we use Tweedle-Dum and Tweedle-De to help us understand translations in flat asymptotical space. I love what animator Matt did here with the characters. But what we are doing is still ‘Bending’, ‘Breaking’ and ‘Blending’ concepts. We are essentially visual wombles, ‘making the use of the things that we find, things that everyday folk leave behind’ and recycling them so they make new meaning. When dealing with esoteric concepts a good metaphor or simile grounds everything in tangible reality. Real symbols and objects can bridge the gap to meaning. An example of this is Henry the Hoover conserving quantities inside a vacuum or using Schrodinger’s cat coughing up a hairball from the ‘soft hair’ of a black hole, meaning that possibly this quantum information isn’t lost. Ultimately there is a balance to be struck between conveying actual meaning and creating engaging, interesting animations. Thankfully the feedback from the physicists has been very positive. Sasha, Andy and Malcolm gave me a thumbs up. I was very keen to make sure any visual translating I was attempting wasn’t getting in the way of the actual meaning. We used an early animatic to build group understanding of where we were going. Having a rough visual map that is animated in time with a voice-over is a massive boost to collaboration – helping us hone ideas so they really work or discard them if they don’t. It also has the benefit of energising and engaging the wider group. Hopefully a lot of people will see this animation, maybe some who are still at school and it will get them interested in learning about physics and black hole science. Wouldn’t it be fabulous if a future scientist emerges, to take Professor Hawking’s work even further and crack yet more mysteries of the cosmos? 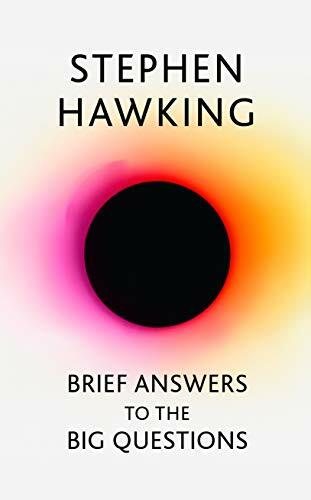 The work that Hawking, Strominger and Perry have done on black holes and Supertranslations can be read about in the new book published tomorrow ‘Brief Answers to the Big Questions’ published by John Murray Press.